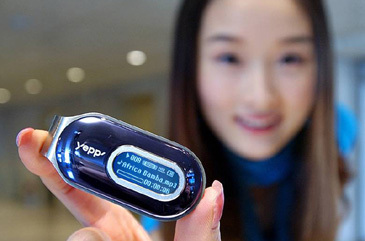 Samsung Electronics' recently released MP3 player "YP-F1"
The South Korean economy is a paradox. It has become the third-largest economy in Asia after Japan and China, and no country has benefited more than South Korea from the rise of China, which has become a vital Korean export market. Its sovereign credit rating was recently upgraded due to reduced tensions with North Korea and it enjoys foreign-exchange reserves of more than $200 billion. It just posted a better than expected third quarter, with gross domestic product growth of 4.4 percent year-on-year spurred by higher than anticipated exports and consumer spending. Its 48 million citizens have in one generation enjoyed a sizable jump in their standard of living and should be full of satisfaction for a job well done. Instead, they are rather a discontented lot. Why? Per capita income is still about one-third that of the Organization for Economic Cooperation and Development average. Economic growth, while robust, is closer to that of a mature economy than an Asian tiger, and Japan's economy is still six times larger. Unemployment is becoming a problem, and a stronger currency and relatively high wage levels are crimping exports — up 8 percent this year after a 31 percent jump last year — which account for 40 percent of the South Korean economy. After a credit-card binge, average net consumer borrowing is equal to 100 percent of disposable income, and the Bank of Korea recently bumped up its benchmark interest rate for the first time in three years. It's your choice: suffer flat or negative returns among the U.S. indices like the S&P, Dow and Nasdaq, or earn double-digit returns from smart international investing. Carlton Delfeld's "Global Opportunity" model portfolio is up 12 percent in 2005, while the DJIA is down 3.75 percent. What is going on here? Somewhat surprisingly, South Korea is experiencing many of the same outsourcing problems that Americans complain about. It was the largest investor in China last year with more than $6 billion in fixed investments. Its largest steel maker, POSCO, announced its intention to invest $12 billion in a steel plant in India, where it already runs 24 steel companies. Hyundai manufactures 600,000 autos in China, and its affiliate, Kia, makes 150,000 more. Meanwhile, Samsung Electronics has become Asia's largest technology company by market cap — larger than Sony — and its largest maker of memory chips, flat-panel screens and mobile phones. Samsung enjoys a credit rating higher than South Korea's sovereign rating. With 62 affiliates, the Samsung group dominates life in Korea like no other company in history. It represents 15 percent of the nation's total economic activity, 25 percent of the capitalization of the KOSPI stock market, and the taxes it pays represent almost 10 percent of total government income. Samsung (tradeable as a global depositary receipt under the ticker "SSNHY"), up 25 percent so far this year, is still attractive at about 11 times consensus 2006 earnings estimates, and its operating profit was up 29 percent in the third quarter. Despite third-quarter net income declining 30 percent, a strong fourth quarter is expected. There is a shortage of LCD television panels, and its flash-memory chip global-market share exceeds 60 percent. As prices have come down, flash chip sales have gone up 40 percent. Samsung dominates life in its home country like no other company in the world. But the slogan "what is good for Samsung is good for South Korea" is open for debate. Samsung is not a terrific play on the South Korean economy. Rather, it is a global play on its three key markets and the expected payoff from its extraordinary commitment to R&D. The South Koreans are discontented because the five largest companies are growing outside the country more than in it and at a stage of development where it should be more competitive manufacturing onshore. The challenge is the low-cost manufacturing platform with huge economies of scale just next door — the problem is China. Samsung already has already has 29 plants and 50,000 workers in China. Mentley's Display Technology Investor is aimed at picking the best investment bets for the booming digital TV and flat-panel markets. Since inception in May, Mentley's Core Display Technology Portfolio is up 55 percent, with four out of six stocks in the black. Brillian alone is up 300 percent. Since China is already starting to manufacture items like machine tools that the South Koreans were busily exporting in 2003 and 2004, South Korean planners believe it must quickly transform itself into a finance, communications and transportation hub — akin to the role of Singapore or Switzerland. The question then becomes, Does it have the right companies, the right skills and what is its competitive advantage? Together, Samsung, POSCO, Korea Electric Power and SK Telecom account for almost 50 percent of the South Korean stock market's market capitalization. To use a basketball analogy, the South Korean starting five are strong, but its bench is a bit thin, and its team has lost the home-court advantage. The problem is not Samsung, rather that South Korea needs about ten more Samsungs. The top four companies make up 40 percent of the iShares MSCI South Korea Index exchange traded fund, which is up 29 percent so far this year. Samsung alone accounts for 23 percent of this ETF and buying the iShares gives you more exposure to the top ten South Korean companies. A smart move would be to take advantage of South Korea's strong third quarter and take some profits off the table if you already own the EWY. The stronger South Korean won and higher interest rates will lead to slower growth and the likely re-emergence of the North Korean problem may very well undermine investor confidence. Bottom line: buy Samsung based on valuation, top-notch global reach and R&D, but expect tougher going for the South Korean economy as China turns from robust export market to direct competitor. Carlton Delfeld is head of the global advisory firm Chartwell Partners and editor of Chartwell Advisor. He served as a director on the executive board of the Asian Development Bank during the administration of President George H. W. Bush, and he is the author of The New Global Investor.